Full disclosure, breakfast meetings are my favorite. Something about sitting down to comfort food in a day that has not yet been tarnished that causes me to go into breakfast meetings with an off-the-charts positivity. All of this is to say, I was probably particularly receptive to new concepts when Jessica Toney, Product Manager here at Epic River, and I sat down with Todd Gentry, the Director of Software Development for D+H, at a cool little breakfast joint in Portland. The conversation started easily and meandered from Todd’s funny parking situation (he drives a BIG car in a decidedly small car town) to my endless list of parenting failures and then on to technology trends (we’re all giant nerds). It’s not an uncommon path as Todd and I get together every month for a very open conversation. It is the kind of open conversation that only comes with a mutual respect formed after years of working together. On this sunny morning in Portland I was first to shift into shop talk. I can’t remember exactly how I phrased it, but it was something along the lines of, “…we can never keep dev fully utilized because everything piles up on QA and we don’t want dev sitting on their hands, so they pull more into the sprint and create an even bigger QA backlog.” I might not remember exactly what I said, but I know I had hoped Todd could either commiserate or provide some guidance. Jessica and I actually sat back in our chairs. We have both been working in software development for years, but this 10 second sentence put us both on our heels. Apparently, one piece of “the old way” of developing software that I never let go of is that developers develop and QA verifies. There was something about the look on Todd’s face and the matter-of-fact way he said it that sticks with me. It was a very small adjustment, but it could have a massive impact on how we develop software. It really drove home how important it is for those of us in the fintech world to lift our eyes from our monitors and agile boards and kanban lists and product backlogs to have face-to-face conversations with our peers. Social media, blogs and tweets are great, and I’ve read lots of books and articles on agile, but there was something monumentally impactful about looking him in the eyes when he said it. It was his face and his tone that convinced me this was a no-brainer. By the time Jessica and I landed back in Colorado, she had a plan for how the team would implement changes by the next week, just in time for our next sprint. 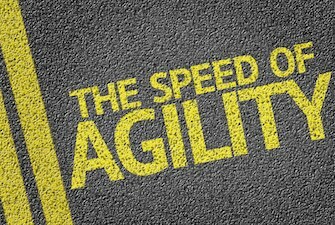 And that is the definition of developing with agility. I waited two sprints to write this because I wanted to see if the changes worked. They did. They worked great, and they spawned even more tweaks to our process and now our team is more effective than ever. We’re never done looking at how we can improve our process, and I’m definitely not done having breakfast with Todd.